City-walking is both an art and a science. As any seasoned city-walker knows (I’m looking at you, New York), success depends on an endless stream of complex crowd-motion algorithms executed with the balletic grace of Neo slow-dodging bullets. Like a persistent spermatazoa wriggling for the egg, we city-walkers waggle, chicane, and drive our way through the crowds of human dreck that litter our path. However in Japan, more specifically in Tokyo, all those fancy commutation computations may be rendered inert by a single oblivious breed. Everybody knows there are two (or more) lanes on the sidewalk, just as there are on the highway. One side is for the slow-walkers, the other for overtaking. Extreme over-takers may even cross the meridian (into the road) and dash along its vertiginous contours like Lewis and Clark trail-blazing the New World (battling with taxis pulling in on a dime and ditzy cyclists traveling contra-flow). Of course sometimes you get clashes in the fast lane as two alpha road-dogs vie for passing pole position, with whatever clattering of suit-cases that may entail. Likewise in the slow lane you often get into an uncomfortable sync with other idlers and slackers, fating you to overhear their inane conversations or suffer the insistent clop of their footfalls at your heels (stalker much? ), unless you are willing to take the extraordinary action of either giddying up (AKA going up a gear) to pass or slugging down to let them escape your gravity well. But those are minor issues of decorum. On the whole the unwritten system works, and people respect the lanes. Except for the moon-eyed walk-in-fronter. This oblivious breed has no respect for the lane system- perhaps has never even heard of it. They wander along like fluffy clouds blown on the breeze, straddling lanes at random, perhaps contemplating the nature of the universe or more likely halting mid-stream to window-shop from a distance- backing up the ambulatory flow and prompting much teeth-grating ire. I have to be somewhere! I often wonder how such people can be so oblivious. They’re not consciously impolite or even rude- grunt or toss them a quick ‘sumimasen’ and they’ll likely bolt from your path like rabbits before a steam-roller. They’re just so caught up in their own existence they don’t notice the oncoming traffic. If they were wild animals I guess they’d be road-kill. Still, there seems something perpetually innocent about the walk-in-fronter. Their carefree roamings, like the wilderbeest upon the plain, speak of a world where there are no natural predators, where the long and cradling arm of public civility guards them in all they do. And that is hardly a con, is it? However, it’s not all as bad as this. There is a way to hack the walk-in-fronter’s oblivious ‘tude, besides the obvious move of bypassing the pavement by looking for carhire . You can exploit this hack with truly minimal effort, and the great news is it works in any kind of restrained space. You don’t even need to throw a cough, loud foot-step (an advanced skill, admittedly), or even stretch to a ‘sumimasen’, as long as you’re prepared to do a little prep in advance. One key thing to note here- Japan is a country of pavement-bicyclists. At first this can take some getting used to- for me coming from the UK it felt like I was in some holiday resort, since cycling on the pavement is pretty much illegal back home. However it does breed in a certain attenuation to the cha-ring of a bicycle bell (most notably of the noble beast ‘mama-chari’). Watch and learn, gaikoku (and don’t miss the end of the video where the hack-troll shows the exploit still working on escalators and even in a conveni). For a great article on general fast-laning strategies- see here. Hilarious! Welld one Michael! 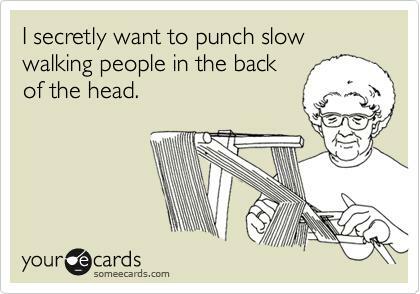 Funniest thing is on any giving day (just as with my driving) I can be either…the one leaning on the horn screaming obscenities from my car window, or the one in the slow lane getting flashed by the car behind me LOL ! Thanks for the smile this morning! As for me, whenever I’m in the slow-lane I’m always super-conscious of appearing hypocritical (to some overly concerned God watching down), so I get AS FAR OVER to the left as I can, near straddling the railing. It is a show of respect for those in the fast lane, I guess, like all the animals bowing to Simba at the end of the Lion King. Thank you for the funny and entertaining read. Glad to hear others also are annoyed by the walk-in-fronters, which -on some days- seem to be the majority in the streets. And now I know how they are called in English: the walk-in-fronters! It is funny that there is no “official” word for walk-in-fronters. Many people know the phenomenon of walk-in-fronters, yet there is no name for them (in Englisch and German at last). Great hack with the bell. Technically it’s illegal to ride on the pavement in Japan too. Are you sure it’s illegal? There are plenty of signs that offer loose ‘lanes’ on the the pavement, between cyclists and walkers. Surely those wouldn’t exist at all if it was really illegal? The situation is like the UK. Bikes are allowed on sidewalks if the local government has designated a cycle lane. It isn’t legal to cycle on the pavement just anywhere, but a lot of cyclists ignore that. One suggestion is to get the ringing bike-bell sound on a cell phone. Then barely even need to suffer the embarrassment of people staring at you, as you could ring the bell from within a pocket, just by pushing a button. That was an interesting article and of course very true. 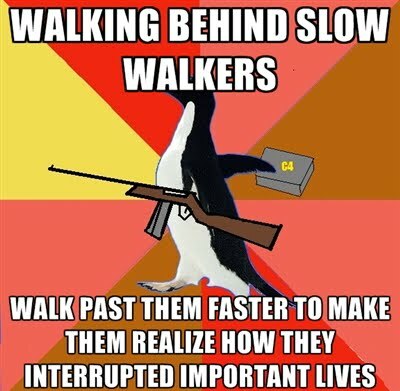 When you are rushing to work or in a hurry, sometimes people on the side walk pose such a big hindrance. They are either engrossed in their own conversations or squabbles on cell phones or with a partner beside and the worst part is when people walk hand in hand blocking the whole pavement. Each one has a different pace of walking, not to be blamed. Please give way for fast walkers and keep the path free. I know that in early morning when you are rushing to the office many of the people are hitted by you or you hit by them.So always try to be move fast from that people hit by you and you didn’t loose your pace. OMG! This video is hilarious… I will die of laughing… Even on the escalators..
Its really awesome video never seen a thing like that. Interesting video and good concept of ringing bell. to follow that rules, mainly for our safe life.Funny article and good dicussion. This is quite funny and innovative way to get a crowded area cleared. It bring in some colour to the serious scenario of blog writing. Very funny video. I really laughed my heart out. This looks like a very new way of clearing out a messy and crowded areas. Ringing a bell looks like a very good idea. This video is hilarious… I will die of laughing… Even on the escalators.Its really awesome video never seen a thing like that. Many people know the phenomenon of walk-in-frontiers, So many of the people are hitted by you or you hit by them.So always try to be move fast from that people hit by you and you didn’t loose your pace. Each one has a different pace of walking, not to be blamed. 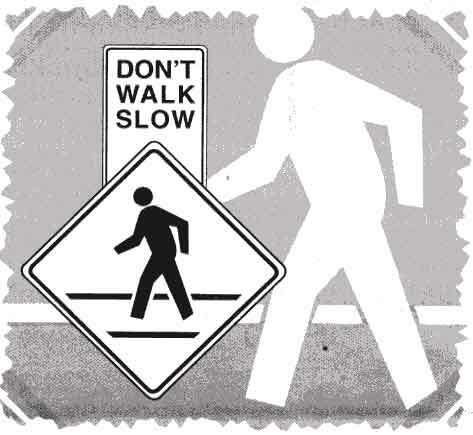 Please give way for fast walkers and keep the path free. Thanks for sharing this wonderful video over here. The video is very funny. I really love it. It is a very cool idea to ring a bell while walking in a crowded area. I rarely come across such situations but love this article. to the screeching sound of the bell.This video was really guffaw worthy. My friends had shared this link on their Twitter page.Initially I was reluctant to even have a glance on it because I dismissed it off thinking as a boring article.But once I started reading the post,I found it very funny and entertaining.The video made me roll on the floor.I hope no one plays this kind of prank with me as it would be too embarrassing.I will share the link on my social network to give my friends a similar laughing dose. I am organising a social get together for my school friends next weekend and was pondering over some new games,magic shows,some activities,pranks and some funny tricks to play around.I am very elated to see this post as I am planning to pick up this wonderful idea for entertainment.I am sure my friends would also appreciate this trick and would play along with me. Very hilarious article. It is really a very cool trick. The video is very funny. When I first saw the article, I wasn’t very much interested. But then when I saw the video, I couldn’t stop laughing. I shared this link with my friends and we all had a very good time laughing.